Super Bowl LIII may still be a week away but the NFL has one more game to tide you over until then. The league’s coaches, players and fans have voted to decide which players from the AFC and NFC will compete in the this year’s all-star game, and with our advice you can get a Pro Bowl 2019 live stream regardless of where in the world you live. The game will be held at the Camping World Stadium in Orlando, Florida for the third year in a row after the NFL decided to move it from Hawaii. This has worked out well for the AFC who have used the home field advantage to win the past two Pro Bowls. This year’s Pro Bowl is taking place right now! at the Camping World Stadium in Orlando, Florida where the best players from both the AFC and NFC will meet on the field in 2019’s NFL Pro Bowl all-star game. This is the third year in a row where the Pro Bowl has been held in Orlando and just as it did last year, the game will kickoff at 3pm ET / 12pm PT / 8PM GMT. The AFC all-stars will be coached by Anthony Lynn of the Los Angeles Chargers with quarterbacks Andrew Luck and Deshaun Watson leading the team. The NFC all-stars will have Jason Garrett from the Dallas Cowboys as their coach with quarterbacks Aaron Rodgers and Mitchell Trubisky. The Pro Bowl is not only a special event for the NFL but it gives players and coaches, often from rival teams, the chance to play together and take a different approach than they normally would on the field. If you’re an NFL fan that’s been following the action all season or just looking to watch the league’s all-stars go head-to-head on the field, then we have you covered. Keep reading and we’ll show you how to watch the 2019 Pro Bowl online from anywhere in the world. 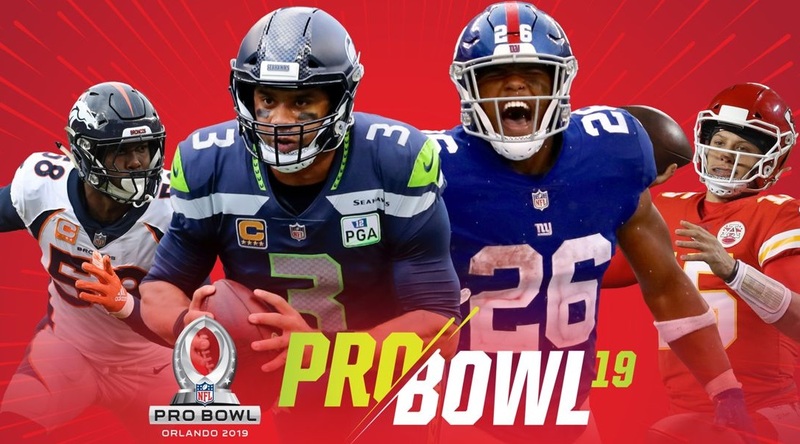 If you live in the US or UK and want to know how to catch the 2019 Pro Bowl, then keep scrolling and we’ll tell you your best live stream and viewing options. From there, you simply open the VPN app, hit ‘choose location’ and select the appropriate location – it’s super easy to do. Choose any country showing a Pro Bowl live stream and watch as if you were in that country. Where can I watch the 2019 Pro Bowl using a VPN? A VPN will enable you to watch the 2019 Pro Bowl from literally anywhere. So that obviously includes: Mexico, Sweden, Israel, Portugal, Brazil, Russia, China, Denmark, Brazil, Japan, China, France, Ireland, Germany, Netherlands, Spain, Canada, Romania and more! If you have a cable subscription that includes ESPN, the network will be showing the game starting at 3pm local time in Orlando (so 12pm PT). ABC will also stream the Pro Bowl live from its site and on its ABC app for iOS and Android. However, you will have to sign in using the account details from your cable provider. Can I watch on the NFL Game Pass? Unfortunately NFL Game Pass subscribers will not be able to watch the Pro Bowl live as it happens. However, if you happen to miss the game or just want to re-watch it later, you can watch a full replay of the 2019 Pro Bowl on NFL Game Pass. Playstation Vue $44.99 per month – Playstation Vue is one option to watch the NFL Pro Bowl and its basic Access package offers over 45 channels including ABC, TNT, ESPN and ESPN2. The service provides top-notch streaming quality as well as unlimited cloud DVR storage so you’ll never miss a game. A5-day trial to Playstation Vue is also available to help you get started and most of the popular streaming devices like Apple TV, Roku and Chromecast are supported. YouTubeTV $40 per month – YouTubeTV gives you access to ABC, CBS, Fox, NBC and ESPN but just like with Hulu with Live TV, there is no NFL Network. Hulu with Live TV $40 per month – Hulu with Live TV includes ABC, CBS, Fox, NBC and ESPN but does not come with NFL Network. NFL fans in the UK with a Sky Sports subscription will be able to watch the Pro Bowl live on Sky Sports Arena. The network’s coverage of the event begins at 7.30pm GMT and you can also catch all the action on your mobile devices with the Sky Go app. If you aren’t a subscriber, you can still catch all the action by purchasing a Sky Sports pass on Now TV. A Sky Sports day pass will cost you £7.99 but there are also weekly and monthly passes available if there happen to be other games (and sports) coming up that you’d like to watch as well. Not in the UK today? Try and watch with the above methods and you’ll quickly find that your access is geo-blocked. If that sounds like you, then you can always download and install a VPN as described above. That will let you then change your IP address to the UK and watch has if you were sat back at home.